When Susan first posted this recipe, Chipotle Barbecued Tofu, there was something about it that tempted me out of my curmudgeonly-ness about barbecue. Perhaps the smokiness of the chipotles. I could still eat soy foods comfortably then. And I still had ketchup in the house for when I made oven fries. I gave it a try and liked it so much that it went on our Thanksgiving menu that year, and Mike and Kelly liked it so much they went back to Portland and made it over and over there, too. So when I realized my symptoms improved when I stopped eating the soy, this was one of the recipes I mourned over. But that was before the dawning of the Mushroom Era in my life. I was first cued in to how portobello mushrooms could be used as burgers in Prevent and Reverse Heart Disease. Back when I read Kathy Hester’s inspired book The Vegan Slow Cooker, I discovered she had an amazing recipe for smoked slow cooker tofu. Since Kathy always gives alternatives for people who can’t eat soy or gluten, she suggested smoking mushrooms. So the seed—oops, I mean–the “spore” had been dropped. . . 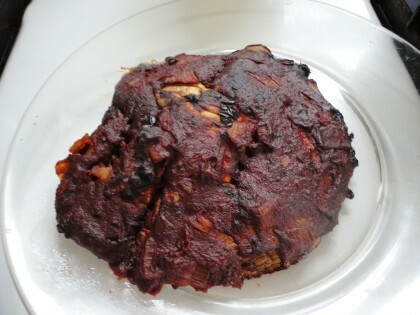 I still haven’t smoked any mushrooms in my slow cooker, and I don’t know why it took me so long to get around to marinating them in this wonderful barbeque sauce (there’s that involuntary “q” again), but the time arrived last winter. I made the sauce and marinated four portobellos in it. I meant to bake them after 24 hours but life got in the way and they sat in it another day. My friend Clark came over for dinner before we went to see the devastating and beautiful film version of Anna Karenina, and we ate them for dinner. He likes spicy things and loves mushrooms like I do, so I knew I had a hit when his eyes got wide at the first bite. If there’s a bit of rain and humidity after a long dry spell, late summer around here usually delivers up some more tasty samples of agaricus campestris mushrooms on my morning walks with Romeo. I came back from Portland to find it had poured buckets here one night, and then stayed kind of warm and even a little humid, with mild sprinkles here and there. Perfect weather for finding mushrooms. I found two large tops, spotlessly clean in the rain, that rivaled the size of the ones I have a photo of in my post Wild Mushroom and Two Rice Pilaf. One of them is in the photo at the top. I’ve changed Susan’s original recipe a little over time in some small ways. I rarely have ketchup around, so I use tomato paste instead. And since I’m a lightweight when it comes to hot and spicy, I use half the chipotles in adobo Susan uses. I leave out the black pepper and use a tablespoon of date syrup, and/or homemade date paste or pear sauce, and I add about 1/4 cup of water and. . . .well, you’ll see in a minute. I have kept Susan’s inspired additions of cinnamon and celery seeds, and I highly recommend you do the same, whether you try my version or hers. I paired these mushrooms with kale massaged in my Easiest Avocado Dressing in the World and some simple plain cooked millet. The combination was heavenly in taste, and easy to digest. I think it’s letting the mushrooms marinate for 24 hours that gives this effect. So here’s the exception to my “I’m not a big fan of barbecue” rule, which I make for this barbecue sauce. . .with mushrooms. Put all the sauce ingredients in a small sauce pan and stir to combine. Simmer until flavors are blended, about 10 minutes or so. Brush the portobellos on both sides with the sauce, which will be thick. Cover them with it, as if it were frosting, and set them in a covered dish in the fridge for 24 hours. When you’re ready to bake them, preheat the oven to 375. For easy clean up, put the mushrooms on baking parchment in a shallow baking dish or on a cookie sheet. (Even if you don’t do this, though the date syrup in the sauce will blacken the pan, it cleans up easily after soaking in water.) Bake the mushrooms for 30-40 minutes, depending on your oven, until they are fork tender and can easily be cut into small pieces. Meanwhile, cook some millet. Directions for that are here. And while the millet is cooking, massage several kale leaves in The Easiest Avocado Dressing in the World. When the millet and mushrooms are done, assemble your meal. 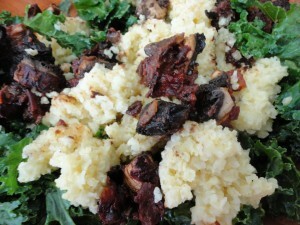 Put a dollop of warm millet on top of the massaged kale, and cut up a mushroom and place the pieces on top of the millet. Mix together and feast. 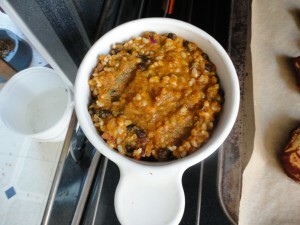 Stir it all up and put it in a little covered oven proof dish like a corning ware grab it. Let it cook for 30 minutes at 375. If it looks too soupy, take the lid off and bake for an additional 5 minutes. I still don’t like barbecue sauce all that much. But I sure like this barbecue sauce. So try this veresion, or Susan’s version, or one of your own inspired by our recipes. Whether it’s spelled with a “c” or a “q,” it makes a simple meal smoke. Your version looks delicious, Maria! And I always have trouble with the “c” versus the “q” in barbec\que, too! 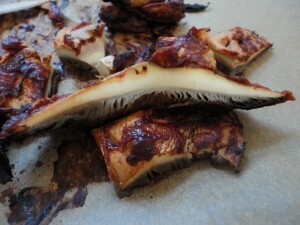 I love mushrooms and I love BBQ! But, I don’t see the chipoltes in the recipe. I quit eating ketchup a long time ago, been using salsa, tomato sauce with added spices lately.